Little Caesars promised and they delivered. Hundreds of Michiganders lined up at their local Little Caesars from 11:30 a.m. to 1 p.m. Monday to grab a free lunch combo – four pizza slices and a 20 oz. Pepsi product thanks to the University of Maryland Baltimore County men's basketball team. Last month, the pizza chain promised to give away free pizza if a No. 16 seed in the NCAA men's basketball tournament beat a No. 1 ranked team. A line of hungry customers at a Little Caesars in Dearborn, on the corner of Monroe Street and Dartmouth Street. 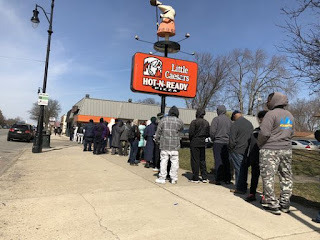 Crowds gathered for Little Caesars free pizza and pop giveaway on April 2 from 11:30 a.m. to 1 p.m. Lo and behold, Little Caesars had to ante up when the UMBC Retrievers beat the Virginia Cavaliers 74-54 on March 16. A line going out the door formed well before 11:30 a.m. at a Little Caesars in Dearborn, at Monroe and Dartmouth. Families, friends and neighbors waited on a crisp April day as the local shop churned out pizza and pop. As the store continued to send customers out the door with smiles on their faces and freebies in hand, the line along Dartmouth Street grew. Yet folks kept in good spirits. Lisa Miltz, 58, was visiting from Grayling and showed up with her daughter-in-law, Samantha Walters, around 11:36 a.m. They were just past the middle of the line at 11:51 a.m.
Miltz said they'd seen about a hundred people come by for free pizza, but the wait wasn't so bad. "(It's the) perfect day for it," she said, standing in the cold sunshine. Floyd Wagner, 52, of Dearborn Heights showed up around 11:50 a.m. with his 9-year-old daughter, Jenna. "Who would've thought that a 16 would beat a 1?" Wagner said. "I think it's cool. I think it's awesome that Little Caesars is paying up, I love it." Wagner, who was wearing some U-M gear, said he's always loved the NCAA tournament because of the spirit and competition, but he's also a longtime pizza fan. "Of course, who isn't?" he said. Jenna said she doesn't really watch basketball, but she does like pizza. Alex Nieves, who works at the Dearborn Little Caesars, was handing out vouchers to the folks lining up. Nieves said it was only her third day on the job, and by around noon, she'd already seen about 200 people since doors opened at 11 a.m. The line outside of Little Caesars on Grand River and Warwick, Detroit, MI. April 2, 2018. In Detroit, at the Little Caesars on the corner of Grand River and Warwick, the line wrapped around the block. For the most part, people were peaceful and patient. Brandee Smith, 29, had no clue what the giveaway was about. She only learned about it via a call from her aunt. "My auntie called my daughter this morning – it's her birthday, she turned 4 years old," Smith said. "(She) told me (Little Caesars) was giving out pizza and something to drink for the kids." Michael Travis, 59, leaned heavily on his cane as he waited in line. "I think it was a major upset," Travis said. "And I think Virginia is still crying." Even after the giveaway ended at 1 p.m., there was still a line of people. 0 Response to "Lines gather for free pizza at Little Caesars in Dearborn, Detroit"